Yesterday I did the post on how president Barack Obama punishes his enemies. I probably should have added an addendum on the post on how Barack Obama also rewards his friends and/or the enemies of his enemies. So, let's see, you have the tea party groups being harassed by the IRS, many of which have yet to receive their status after years of delay, and then you have Barack Obama's brother's organization fast tracked with special treatment from the IRS. Just a coincidence, I am sure. 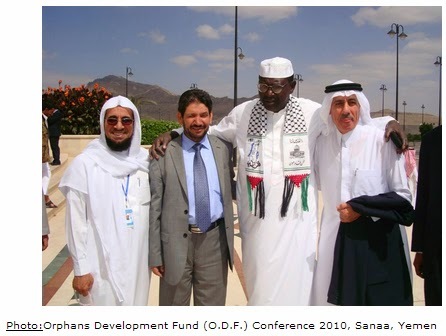 In more disturbing news about Barack's half-brother [best man at Barack and Michelle's wedding], PJ Media has found this picture of Malik from 2010 with a "Hamas" scarf around his neck. Yes, I said Hamas, the same Hamas that is the terrorist group dedicated to the destruction of Israel. Malik's Hamas scarf says: "Jerusalem is ours – WE ARE COMING!" Hmm, now that I think about it, I'm wondering if this is an example of Barack Obama rewarding his friends or rewarding an enemy of his enemy.